We have a fantastic location on the southern bank of the river, only 5 kms or 5 minutes drive from both the town of Margaret River and our world renowned swimming and surfing beaches. We are on the doorstep of Cape Mentelle Vineyard, one of the best known wineries in the area and only 5 -10 minutes drive from Watershed, Xanadu, Voyager and Leeuwin Wineries, 4 of the best winery restaurants in Australia, as well as Art and Craft Galleries, famous caves, National Parks and other attractions. 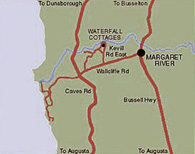 To get to us you take the Wallcliffe Rd turnoff from Bussell Highway towards the coast, (turning right if travelling South), travel 3 kms and turn right again into Kevill Rd East (just before Cape Mentelle at the Waterfall Cottages sign). The cottages are 2 kms down Kevill Rd East on the left. To get to the office you go past the cottages another 400 metres till you see the Waterfall Cottages Office sign at 245 (Lot 12) Kevill Rd (second road on the left). The office is located in the courtyard on the right.